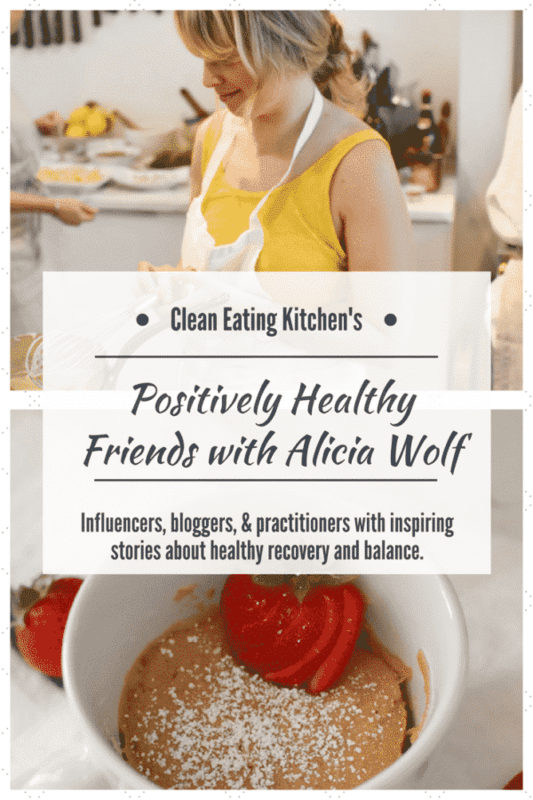 Alicia Wolf is a healthy living blogger and creator of the site, The Dizzy Cook. Alicia shares specialty recipes and tips for people suffering from migraines. Did you know that there are dietary choices that can trigger migraines? I vaguely knew that red wine and chocolate have been known to be in that category, but it turns out there are a lot more foods that can be culprits, too. Alicia reached out to me when she heard me on the Food Blogger Pro podcast where I mentioned that I had suffered chronic migraines in the past. 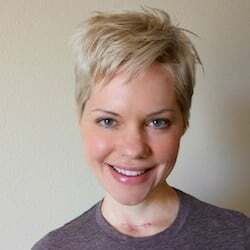 We got to chatting online and I fell in love with her gorgeous blog, not to mention her positive and encouraging attitude. Oh yes, and we both used to live in the same city in Oklahoma, so we have that in common too (sometimes the internet feels like such small world). 🙂 Alicia was diagnosed with a special type of migraine that causes dizziness, hence the name of her site, The Dizzy Cook. 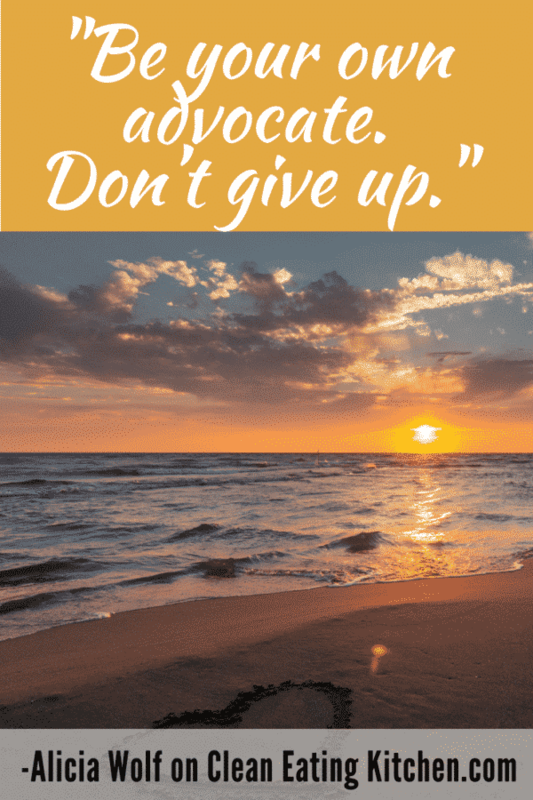 I asked Alicia to share some of her inspiration and advice in this special feature on my blog that I call Positively Health Friends where I interview bloggers, practitioners, and experts with stories of holistic healing and recovery. I am especially grateful to Alicia for recommending to me the book that helped her, Heal Your Headache, because I learned so much from it about managing this absolutely debilitating condition. Having a migraine is truly the most painful and miserable and truly awful experience I’ve ever had, and getting them under control using lifestyle techniques has made the biggest difference in my overall quality of life. 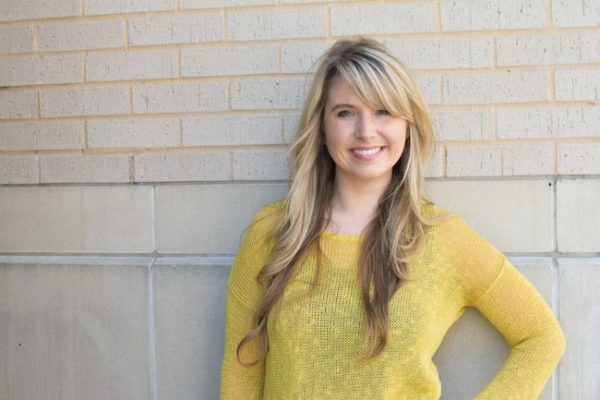 I hope you enjoy this written interview with Alicia about using diet to heal from migraines! Hi! I’m Alicia Wolf and I started The Dizzy Cook , a diet and lifestyle website for people with migraine. What’s your first memory of understanding the connection between food and health? My mom was in nutrition education for cancer patients so I’ve always had a good understanding, but it wasn’t until I became chronically ill that I heavily researched alternative ways to heal migraine. I had just read a book by Dr. David Buchholz from Johns Hopkins called Heal Your Headache and thought I would give the diet a try. After about two months of trying the elimination diet, I thought the whole thing was stupid and tried to eat some yogurt, which is one of the items you must eliminate on the diet. Almost immediately I got the intense vertigo that I had experienced when I first became ill with vestibular migraine. I used to eat yogurt every day with no noticeable connection to my symptoms! I knew right then that the diet was helping me find my food triggers and lower my overall symptoms. What, if any, health issues have you overcome? What are the biggest changes that helped? I was diagnosed with chronic vestibular migraine after seeking help from about 10 doctors who misdiagnosed me with everything under the sun. I was even told I needed inner ear surgery and would be deaf as a result. I went from never leaving my bed or being able to drive to being, to being active, dancing, and traveling again. The biggest changes for me were from adding magnesium glycinate, CoQ10, riboflavin, vestibular therapy, and the Heal Your Headache diet. What is one lifestyle change you’ve made in the last year that you’d like to share? I added in a ballet class! With vestibular disorders, some damage is done to your inner ear, which is responsible for your balance. You typically have to do therapy to re-train your brain to accept movement without causing vertigo or dizziness. Ballet has helped me gain a lot of that balance back. What are some products that make you life easier? How do you use them? Magnesium chloride flakes! They are a great way to supplement magnesium and provide the ultimate relaxation for a migraine brain. Sometimes I’ll even make my own magnesium oil with them. Applying it to your feet gives you the best results. What’s your morning beverage of choice? How do you make it? Swiss water processed coffee with a little bit of Oatly oat milk in one of my favorite Disney mugs (Olaf usually wins). Caffeine is one of my biggest triggers, and even regular decaf will increase my symptoms. Naturally decaffeinated coffees like Swiss Water Process are 99.9% caffeine free without using chemicals to process it. What’s your favorite vegetable and how do you like to prepare it? I think parsnips are really underrated. I like to steam them then whip them in the food processor with a little ghee and vegetable stock. It’s similar to mashed potatoes. Trader Joe’s also sells them in chip form and you can’t put them down. Instant Pot, yay or nay? If yes, what’s your favorite food to cook in it? Both yay and nay. I love it for migraine-free cooking because it eliminates the build up of tyramine that you would get from simmering a stock all day long. However, I think some recipes lose a lot of rich flavor you typically get from a crockpot meal when you cook them so quickly. Good thing you get both cooking options with the Instant Pot! Are you a smoothie fan? What’s your favorite smoothie addition? Yes! My favorite addition is probably lucuma. Bananas are a migraine trigger for me so lucuma powder gives me a sweet, butterscotch flavor with a low glycemic index. It’s from a Peruvian fruit that’s been shown to help with tissue regeneration and healing. Do you have a mantra or piece of advice you can share with women who might be dealing with a chronic health issue? Be your own advocate. I can’t tell you how many doctors told me this was “all in my head” or that I was simply suffering from anxiety. We are very intuitive and we know when something is truly wrong with our body. Keep searching for that perfect doctor, they’re not always easy to find, but they’re out there. I found one that was willing to work with me on a more natural route. Don’t give up until you’re satisfied with your treatment plan. Favorite podcast or health/nutrition-related book? My husband got me into listening to Dr. Peter Attia. His interview on Invest Like the Best is worth the time. What’s one recipe you’d love to share? 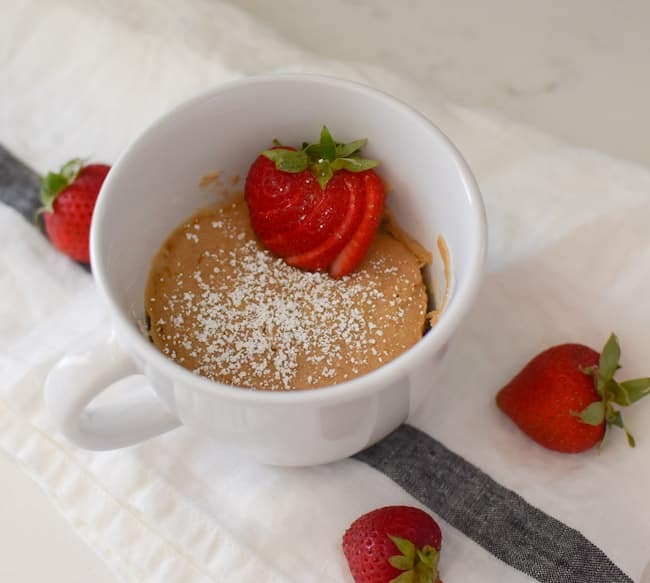 Mug cakes are the perfect dessert for me because it satisfies a sweet tooth quickly with pantry staples. I could never find a good recipe that was gluten-free and nut-free, so I spent a week testing one of my own. This Vanilla Sunbutter Mug Cake can be made in less than 5 minutes and you can top it with whatever fruit you love. Any other products or programs you’d like to share? I’ve created an exclusive opportunity for Clean Eating Kitchen readers to access my ebook, Guide to a Migraine Diet. Use code “THEDIZZYCOOK” for free access. Thank you, Alicia, for your insight and inspiration!!! This is great! I have a friend who is a neurologist. She once told me that her favorite patients were those with migraines because she could almost always get them migraine free. How? 2) stop the meds which far too often cause rebound headaces creating a viscous cycle! Thanks, Geoffrey! I have also found those two techniques to help me get control over my migraines. Hope you’re having a great summer!